This spicy classic from Sichuan is very easy and quick to make. That’s the main reason why I love stir fries and cook them often. Besides, you can make it with different sauces and ingredients to get a great depth of flavor. 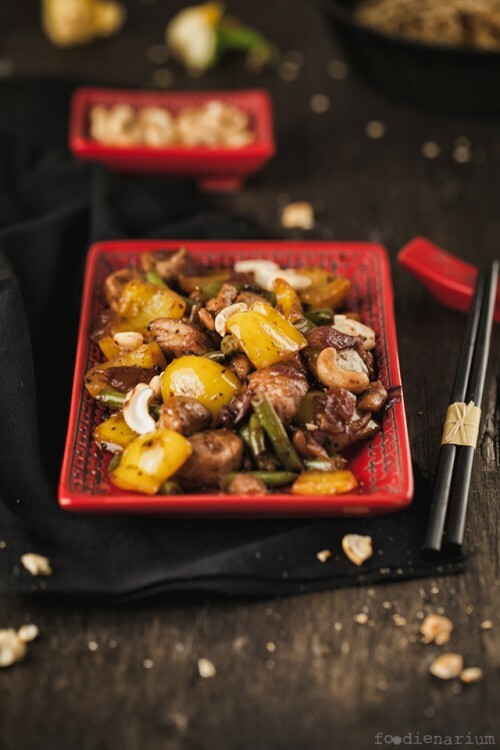 My recipe is a modification of Grace Young’s recipe SIchuan Pork with Peppers and Peanuts from Stir-Frying To The Sky’s Edge cookbook. In a bowl combine the pork, egg white, 1 tbsp of the wine, cornstarch, the 2 teaspoons minced garlic, sugar, 1/2 tsp of the salt, and 1/2 tsp of the pepper. Stir to combine. In a small bowl combine the soy sauce, vinegar and the remaining wine. Heat a wok over high heat until a bead of water vaporizes within 1 to 2 seconds of contact. Swirl in 1 tbsp of the oil, add the red onions and the remaining 1 tbsp of sliced garlic. Using a metal spatula stir fry for 1 minute or until the onion wilts. Push the onion mixture to the sides of the wok, carefully add the pork, and spread it evenly in one layer. Cook undisturbed for 1 minute or just until it begin to burn. Add the chili sauce and stir-fry 2 minutes or until the pork is lightly browned but not cooked through. Transfer the mixture to a plate. Swirl the remaining 1 tbsp oil into the wok. Add the bell peppers, 1/2 tsp salt and 1/2 tsp pepper, reduce heat to medium and stir-fry for 1 to 2 minutes. Add the green beans and stir fry for 1 to 2 minutes more. Return the pork into the wok, turn heat to high, swirl the wine mixture into the wok, and stir fry 1 to 2 minutes or until the pork is just cooked through. Stir in the cashews and serve.